Much has been written in this world on Beauty. Someone once said that Beauty is how you feel inside, and it reflects in your eyes. It is not something physical, while many others insist on beauty being eternal only when it is outside and inside and when the latter is timeless. Cited overwhelmingly as the ‘the most beautiful woman in the world’, Aishwarya Rai Bachchan avows much of what has been said on beauty and beautiful people. She is beautiful outside; is beautiful inside --as a person and has managed to stay this way, over the years. 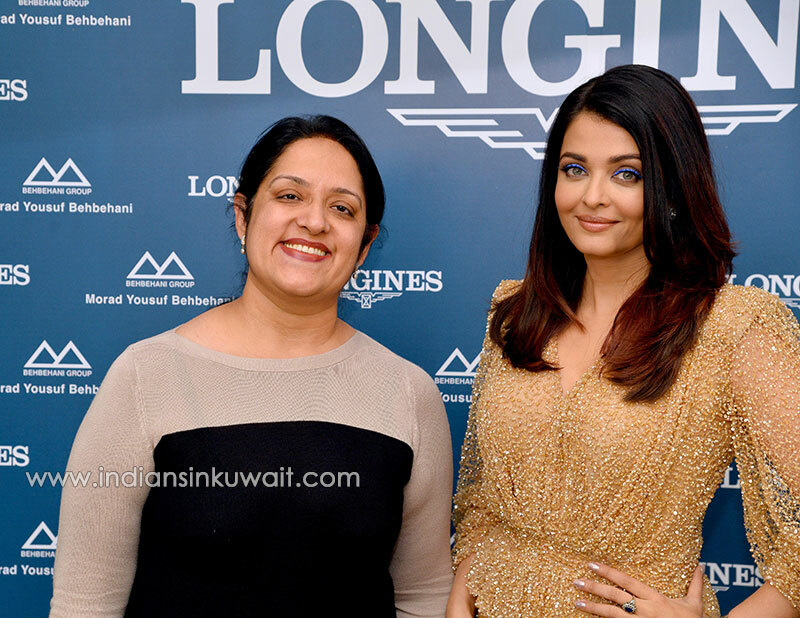 One of the most popular and celebrated personalities of India, Aishwarya Rai Bachchan was here to launch a new Longines store at Grand Avenues. Selling watches since 1832, Longines is a brand that carefully blends Tradition, Elegance, and Performance. Who could embody Longines' motto "Elegance is an attitude" better than Aishwarya Rai Bachchan? The Indian beauty has been the face of the Swiss watch brand since 1999. Navniit: A new year has just dawned and so, do you set horizons for yourself every year afresh or wait for life to unfold on its own? Navniit: You are regarded very well for not having lost your individuality and yet for having honoured your commitments to your family and to your profession, in addition to your social and commercial commitments. Is all of it so very important for you that you strive hard to maintain that balance? Or, it just somehow happens? Aishwarya Rai Bachchan: Balance has always been important to me. And yes, thank you for saying that I am well-regarded for it. But, at various points of time, if I had focussed on the thoughts and views of others, who knows how the course of events might have been. It is therefore very important to remain in touch with one’s own voice and find your own pace with which one is comfortable. I think then in all earnestness, the journey will be honest. You can then be your own best friend and approach each experience for what is and enjoy living. This is very important to me—to find my own calm and peace and sense of bliss; to find that sense of satisfaction in the moment. Aishwarya Rai Bachchan: Well, people have said to me as well: that why are you doing this and why aren’t you doing this and why aren’t we seeing more of you here or there… It is sometimes seemingly less and sometimes seemingly a lot but that is all a matter of perception. You know your own reality. Only you can know best as to what is it that really needs to be done in a given moment or a day. and once I know what needs to get done, it is very important for me to get that done. Integrity and commitment are very precious to me. It is important to take on what one can chew or take on just about as much as you can on your plate. I know these may sound cliché sayings, but knowingly and sometimes unknowingly, I have conducted myself thus every waking day. Navniit: And, have you never found yourself racing against time for doing all of that which needs to be done? Aishwarya Rai Bachchan: Time is most precious and you can never enough of it any given day. There is always so much to do but you need to find your own rhythm; believe in it; experience it and live it. That is who I have been and it is just ingrained in me. Navniit: What are the key on-going projects/assignments you are involved with? Aishwarya Rai Bachchan: Life is busy and it is difficult to nail it all down to just one or the other thing. For the working women, who have families as well---there is always so much to do and there is a lot happening in mine too. There are some interesting ideas taking shape in my career… At the same time, I have been spending quite a lot of time with my mother, after my father passed away and I am busy with my daughter, my husband and with my family too. There has always been a natural pacing out… At that time, when I was spending time with my mother---I did not try and define why and what was I doing. Today, in hindsight, I recognize I did what needed to be done and yes, did a movie too but took on a part which I knew would not take much of my time and so I could give time to life; to people who are precious to me. From the past couple of months, I have been hearing out interesting scripts. But it is also true that right from the days when I began, I have never been in a rush. I know my pace… If I find a piece of work that is interesting---I take it up and it consumes me entirely. Guess, my work-ethics and my approach to my life and career has been this. It is not about how small or big is the role or the part or the film-maker but it is about committing and once I commit I live by that and give to it my soul. Hence, from the time that I began till this very minute that I speak to you—I have never known an easy pace in life; life has been very full every day and I do look upon it as a blessing. The fact that I am scrambling for time and time is flying – I think it is a great sign; it means I am living this blessing called Life—full on!!! Navniit: You have been adjudged the most beautiful woman in this world. Do you think the parameters of defining beauty have altered in the present times? Navniit: The association with Longines has been a long one... How has it evolved over the years? Aishwarya Rai Bachchan: Oh, it has been a long and wonderful association indeed!!! In 1999, I was first approached by them and for me it was brand of watches; a company that had been there for a long time; a company that had a glorious history in watchmaking and had some amazing Brand Ambassadors as Audrey Hepburn and Humphrey Bogart and I felt privileged indeed… I had just started doing movies and to be admired along with such iconic talent that represented the brand—was overwhelming. I felt honoured that they chose me to come on board; that I was going to be one of their brand ambassadors. Navniit: How do you see yourself relating to this iconic brand you represent—-perhaps its insistence on Tradition, Elegance, and Performance??? Aishwarya Rai Bachchan: What impressed me the most; grabbed my attention was their motto: Elegance is an attitude. I knew then that if this is what I am standing for—it feels like home… I felt that it was going to be a long symbiotic journey ahead. I was happy to be on board but little did I know then that this relationship was going to span for two full decades and more. Twenty years have passed and I recollect the first press conference that I was there for, I was told that ‘this is going to be a long journey with you’. At that time I thought that a long journey perhaps meant,---three or five years at the most. Never did I dream that twenty years hence, I would be sitting here and endorsing the brand. I feel happy and it makes me smile that I belong to the Longines family. They have been a part of all my milestones---personally and professionally and so wonderfully. I am grateful indeed for the love and warmth they have shown. Navniit: May this journey remain a fruitful one, even in the years to come and may you have a wonderful life ahead ---replete with many a joyous moments and memories.